Endeavour’s last flight was watched intently by a new generation of space wizards at the Mojave Air and Space Port on Sept. 21, 2012. 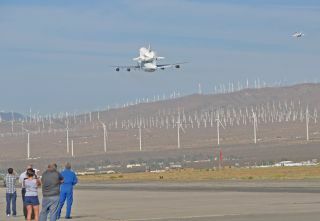 Engineers and technicians from The Spaceship Co., Masten, XCOR and other Mojave companies accompanied by their families watched in awe as Endeavour and its 747 carrier aircraft made two passes over runways that launch and land the next generation of space vehicles. As NASA's space shuttle Endeavour orbiter flew to its retirement home in sunny California today (Sept. 21), Gov. Edmund G. Brown Jr. signed legislation to bolster the commercial spaceflight sector in that state. The Assembly bill limits liability for private spaceflight companies. Leading the measure that was targeted to an emerging industry in California was Assemblyman Steve Knight (R-Palmdale). Last August, the bill unanimously passed in both houses of the California State Legislature. Knight also said in a statement that, until recently, human space travel was accomplished through government space agencies, with volunteer participants assuming liability for injury and damage. Assembly Bill 2243 provides limited liability for commercial space ventures to ensure innovators remain competitive in this promising marketplace. “California, and specifically the High Desert, has a long tradition of pioneering aviation for a century, and human spaceflight since the Apollo era, and was the site of the first private human space flight event, which resulted in the winning of the Ansari X Prize in Mojave, California, in 2004,” Knight said. A full-size replica of the Virgin Galactic Spaceship Two sits at the Farnborough International Airshow, Hampshire, England. The image was taken July 9, 2012. Over the past few decades, Knight added, California has lost a significant slice of its human spaceflight industry development to other states, specifying Alabama, Colorado, Florida, New Mexico and Texas. The human spaceflight business in California, he said, continues to struggle due to the poor business climate in general, and the current litigious environment. The bill-signing was praised by Virgin Group founder Sir Richard Branson, who called California a state that tears down barriers and cultivates innovation, from social movements like environmentalism to the start-up culture of Silicon Valley. Branson called the bill a benefit to the teams at Virgin Galactic and The Spaceship Co. at the Mojave Air and Space Port — the construction site of the WhiteKnightTwo/SpaceShipTwo launch system. “This legislation will ensure that California continues to be a place that looks forward … and not back,” Branson said. For a complete look at the newlegislation, visit: http://leginfo.ca.gov/bilinfo.html and enter Assembly Bill 2243.